Graham Phillips from Hamilton Waikato, New Zealand, awarded the Gold Medal of the American Daffodil Society. The Gold Medal of the American Daffodil Society is awarded to an individual deemed by the Honors Committee as being worthy of “recognition of creative work of a pre-eminent nature in the understanding and advancement of daffodils”. Both of these ADS Medal Recipients have many accomplishments and accolades which will be revealed in an article within the upcoming Daffodil Journal. You can also review a press release about Mr. Phillips accomplishments, and past recipients of this prestigious award, on the ADS Gold Medal Recipients page of our website. Please review a press release about Ms. Graves accolades, as well as other recipients of this outstanding service award, on the ADS Silver Medal Recipients page of the ADS website. Grant Mitsch was the recipient of the 2018 Pannill Award for his flower, ‘Engagement Ring’, 3 W-WWY. Registered in 1994, Engagement Ring was bred from two greats, Silken Sails (1964, Green Island x Chinese White) x Merlin (1956, Mahmoud x Mahmoud). 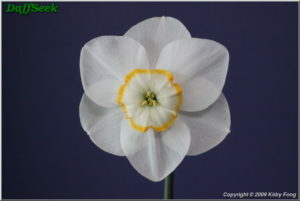 It is an extremely consistent flower that opens nick free and develops a bright rim on an a pristine white flower. This flower is one to cut and bring inside to watch its colors develop and is best seen up close. Engagement Ring blooms during late mid-season. See past outstanding exhibition daffodils that have been awarded the Wiliam G. Pannill Award on The Pannill Award of The American Daffodil Society page of our website. ‘Mount Hood’ is the recipient of the 2018 Wister Award. Registered in 1938, it has a proven track record for longevity and shows up annually on the show bench in the Historic section. 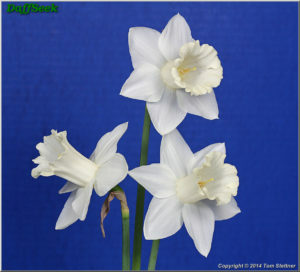 Dutch-bred, Mount Hood is one of the finest white trumpet daffodil for landscape purposes, and a single bulb will make a clump which will bloom for many years without digging and dividing providing it has sun, decent drainage and room to increase. See past outstanding garden daffodils that have been awarded the John and Gertrude Wister Award on our The John and Gertrude Wister Award page of our website.